The High Performance Solar Deck and Wall Light is manufactured from durable stainless steel, offering a streamlined contemporary design. The warm colored light cascades downward to create a soft ambience. 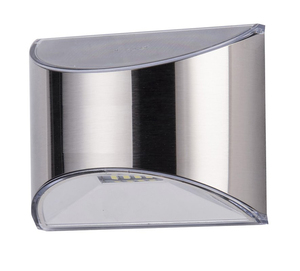 This compact design makes it a perfect accent that can be placed almost anywhere. An appealing addition to any landscape such as decks, stairways, patios, gardens and much more. Product Dimensions (HxLxW): 4" x 2" x 3.25"